From time to time, I go back to my old university and give lectures on digital marketing. At the end of the Q&A session, one of my students said to me, “Darren, why are you even talking about Facebook? Facebook is dead. I don’t use it. I don’t know anyone else that uses it so why are you even talking about Facebook?” Well, I don’t think Facebook is dead even though many people do think it’s dead. I’m going to tell you exactly what I think and my thoughts on Facebook and its longevity coming up after this. Hey guys, Darren Taylor of thebigmarketer.co.uk here, giving your tips, insight, and opinion on all things marketing. If that’s up your street, you should consider subscribing. 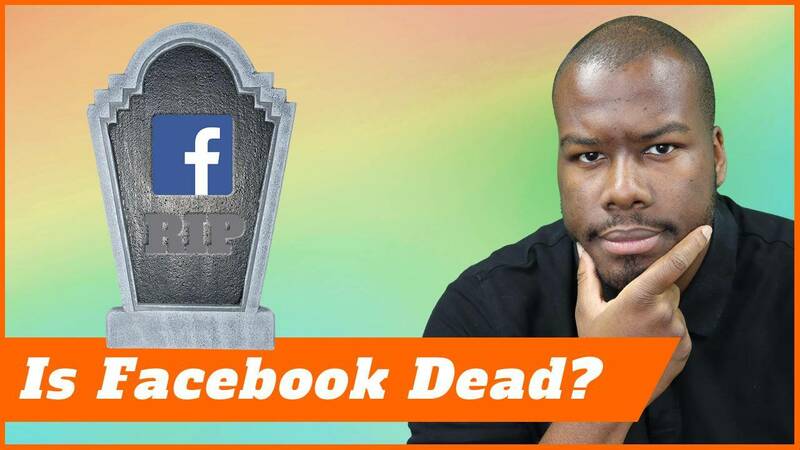 Today, we’re looking at whether Facebook is dead or very much alive. Now, previously I’ve spoken about Twitter. I’ve planted my flag firmly on the side of thinking Twitter is in trouble. What do I think about Facebook? I don’t think Facebook is dying at all. Now, if I was 21, 20, 19 years old and you asked me that question, I would probably say yes, Facebook is dead. The reason for that is because millennials don’t give a damn about Facebook anymore. They don’t use Facebook, they don’t interact on Facebook. They think their parents are spying on them on Facebook, so they tend to use social media networks their parents aren’t going to be, but does that mean the future is bleak for Facebook? Definitely not. Facebook’s revenues are growing year on year on year. Is Facebook Dead? Erm, Nope! The reason for their growth in revenues and their sustained strong revenue growth and stock value is because people are spending money on Facebook advertising more and more. Brands are spending, businesses are spending, bloggers are spending, everyone is spending on Facebook because people with money are on Facebook. Sorry, millennials, most of you don’t have much money. Let’s be honest here. Most business people, people in business, high-value audiences, people with money to spend are on Facebook because they’re a bit older. They’ve had more time to build up their revenue, their wealth, and their growth and they’re still on Facebook. Myself, I’m 30 years old. I don’t use it a huge amount, but I am definitely on Facebook and I do advertise on Facebook, of course, myself in terms of marketing. By the way, with millennials on Facebook, Facebook didn’t actually need millennials to come onto the platform, because if you look at this chart, you’ll see Facebook adds new active users every single year consistently. They’ve got a consistent growth of new users coming on board, and that is because people who are older are actually discovering Facebook and coming into the fold. It’s not young people joining Facebook who can finally take out an account at the age of 13. That’s not where it’s coming from. The growth is coming from much further up the age ladder and it’s from people who want to just decide to get in touch with family and friends and discover people they’ve engaged with in the past through Facebook. That is great for their network. Finally, I know I’ve touched on it earlier, but their advertising product is absolutely amazing. The targeting you can get on Facebook ads is fantastic. You can get really specific, really niche or as wide and broad as you like, so no matter what you’re promoting, whether it’s a product or a service, it doesn’t matter. Your audience will be on Facebook and you will make a lot of money doing it if you do it right. An answer to the question, “Is Facebook dead or not?” Definitely not, Facebook is far from dead. Their acquisition of Instagram years ago is really going to help boost that because Instagram’s another social media network seeing massive growth. The biggest demographic shifting onto Instagram is actually women over 40. Again, even though millennials might not like some of these social media networks, they shouldn’t be ignored and the growth continues to be strong. Again, people with money are on Facebook. Facebook is far from dead. Thank you, guys for watching. If you liked this video, please leave a like below. Let me know what your thoughts are on Facebook. I want to hear from millennials in particular too. What do you think of Facebook and why do you hate it so much? More important than that, don’t forget to subscribe. I’ll see you guys next time.